In his first full game, Emmitt Smith promptly broke Florida's 40-year old all-time single game rushing record, carrying 39 times for 224 yards and two touchdowns as the Gators upset the Crimson Tide. He finished the 1987 season with 1,341 yards and was named Southeastern Conference and National Freshman of the Year. He finished the 1989 campaign with Florida records for rushing yards in a season (1,599), rushing yards in a single game (316 versus New Mexico in October 1989), longest rushing play (96 yards against Mississippi State in 1988), career rushing yards (3,928), and career rushing touchdowns (36), among many others. In all, Smith owned 58 school records at the conclusion of his Florida career. Smith was subsequently inducted into the University of Florida Athletic Hall of Fame as a "Gator Great" in 1999, the Gator Football Ring of Honor and the College Football Hall of Fame in 2006. 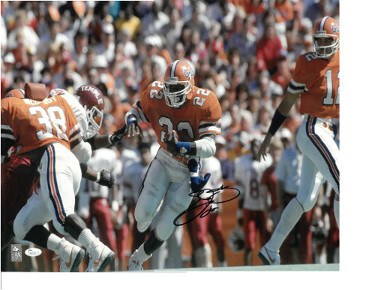 Emmitt Smith has hand signed this Florida Gators 16X20 Photo #22. Emmitt Smith Hologram and JSA Hologram #N60101 and Certificate of Authenticity from Athlon Sports Collectibles.